The presidents of Loyola University New Orleans and the Catholic University of Honduras, “Our Lady Queen of Peace” (UNICAH), today signed a memo of understanding that would bring Loyola’s MBA program to Honduran students starting in January 2012. Loyola President Kevin Wm. Wildes, S.J., Ph.D., and UNICAH President Elio David Alvarenga Amador, Ph.D., agreed to a five-year academic collaboration that would include both short- and long-term faculty exchange, collaborative research and discovery exercises, and graduate and undergraduate exchange between the two universities. A signing ceremony was held yesterday on UNICAH’s campus in the capital city of Tegucigalpa and was attended by officials from both schools and a delegation of top Honduran diplomats, including Honduran President Porfirio Lobo Sosa and Vice President María Antonieta de Bográn. U.S. Ambassador to Honduras, Hugo Llorens, was instrumental in bringing the parties together. In addition to his teaching and research responsibilities at Loyola, Treviño has been tasked with developing Loyola’s programs with Latin American universities and looked at a number of universities for the MBA agreement. He said UNICAH was the best fit as a Catholic university that shares Loyola’s mission of educating the whole person. 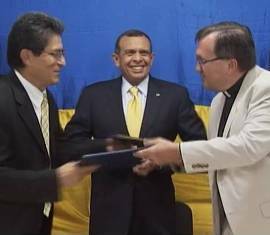 “This agreement will provide for Hondurans the ability to educate its leaders by providing not only the technical aspects of business, but also the spiritual and ethical components and leadership that we as a Catholic, Jesuit institution value,” said Treviño. The program will target business professionals in Honduras with five to eight years of experience and will offer classes, delivered in English, to students at UNICAH in an MBA executive format. Honduran students who complete their MBA coursework through this agreement will earn a Loyola degree. "This is a major step forward for the College of Business in allowing it to achieve its goals," said Locander. The partnership between Loyola and UNICAH is a result of a different memorandum of understanding with eight New Orleans area universities, including Loyola, which President Lobo Sosa signed last fall while on a diplomatic visit to the city. That agreement, coordinated by Honduran Secretary of State Miguel Pastor Mejia and audited by Televicentro Foundation, opened up opportunities for scholarships, research and exchanges between schools in New Orleans and Honduras. Mayra Pineda, president of the Hispanic Chamber of Commerce of Louisiana and official liaison between the governments of Honduras and New Orleans, has also been very involved in the coordination of efforts on both sides. The connection between New Orleans and Honduras is more than a century long. Many of the early immigrants came to the region as employees of the United Fruit Company. The Honduran community is currently the largest Latino population living in the New Orleans area and New Orleans has a larger Honduran population than any other American city. At Loyola, Hondurans represent the highest percentage of international students at 10 percent. For more information, please contact Loyola’s Director of Public Affairs, Meredith Hartley, mhartley@loyno.edu or 504-722-6078.